Signs of Abundance Tour – The information on this page complements that which appears on the sign that has recently been erected on Sandpiper Drive near Millard Creek. To go to the map of all the signs in this series click here. Blue Carbon refers to coastal vegetation such as salt marsh grasses, eelgrass and other seagrass that sequesters or takes in carbon dioxide (CO2). This reduces the amount of CO2 in the atmostphere and helps to limit global climate change. The eelgrass we have locally is zostera marina. It is widely distributed throughout the Northern Hemisphere. It is a flowering marine plant with long thin leaves that can grow over 1 meter long. In addition to reproducing via flowers it spreads by growing rhizomes (also known as rootstalks) under the sand which send out roots and new above ground plants. 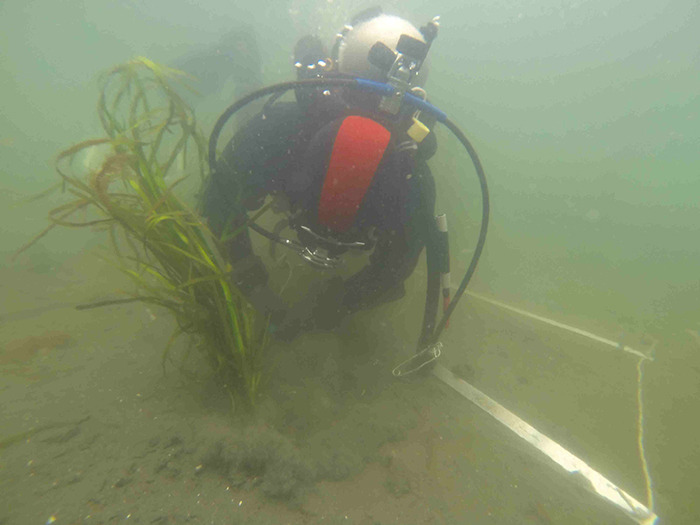 In addition to sequestering carbon, eelgrass provides food, shelter, and nursery habitat for many marine species including herring, crabs and salmon. For more information on salt marsh click here. 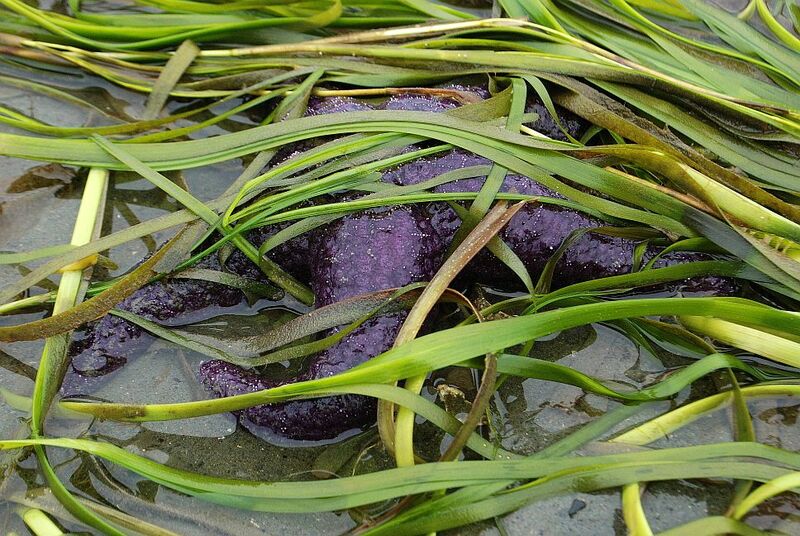 Intertidal planting of eelgrass can be done on foot as the tide recedes but subtidal plantings need to be planted by scuba divers and often requires the use of boats making it a more expensive endeavor. Results of highly detailed mapping and radiocarbon dating at a vast and largely unknown intertidal fish trap complex indicate a large-scale, technologically sophisticated Aboriginal trap fishery operated at Comox Harbour, Vancouver Island, British Columbia between about 1,300 and 100 years ago. For details and images about this study click here. Archaeologists and natural historians have long been fascinated by shell middens because of their great potential to enhance information about human adaptations and cultures. Early studies focused on the Mesolithic køkkenmøddinger (“kitchen middens”) of northern Europe, but similar studies were conducted in Canada by the late 19th century. The English term midden is derived from a Scandinavian root referring to a trash heap composed of domestic refuse and located near a dwelling. The term shell midden refers to such a heap composed predominantly (50% or more) of the shells of MOLLUSCS and/or other shell-bearing animals such as ECHINODERMS and ARTHROPODS. The term shell midden was once commonly used to designate an archaeological site type but is now mostly employed to refer to a type of archaeological feature. Thus, shell middens are features that occur in some – but not all – shell-bearing archaeological sites, along with other types of deposits, such as natural soil layers, anthropogenically modified soils, dwelling floors (often the remains of houses constructed and occupied by the people who accumulated the shell middens), hearths, storage pits, mortuary features and so on. Archaeological sites containing shell middens present archaeologists with stratigraphic and ZOOARCHAEOLOGICAL puzzles that are intriguing, challenging and daunting. Information shown here is from The Canadian Encyclopedia. 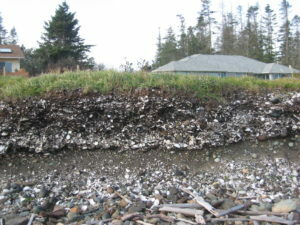 Shell middens develop where human populations – whether hunter-gatherers, horticulturalists, agriculturalists or industrialists – harvest large quantities of shellfish, shuck out and process the meat for consumption and/or use the shells as raw materials, and leave large quantities of shell debris on their habitation and processing sites. Shell middens are a world-wide archaeological phenomenon, most frequently found on sites adjacent to marine shorelines and composed of marine shellfish remains (seeSEASHELL), although shell middens composed of the remains of freshwater molluscs also occur in interior riverine locations in many places. Once thought of as a hallmark of the Mesolithic and Neolithic periods, following the end of the last glaciation (10 000-12 000 years ago), shell middens are now known to date from early in the Upper Palaeolithic (ca. 160 000 years ago) through to recent times. The earliest known shell middens have been found in South African near-shore caves and were accumulated contemporaneous to the emergence of anatomically and behaviourally modern humans (Homo sapiens sapiens) from archaic hominin populations. Studies of shell middens contribute to the development of archaeological history in Canada in five main ways. First, when past people accumulated shell middens, they produced stratified archaeological sites, and enhanced cultural component separation, in contexts where these phenomena would otherwise be unlikely to develop. Second, shell middens allow and enhance the preservation of a variety of organic materials (shell, bone and charcoal) amenable to radiocarbon dating. Together, these two factors enable archaeologists to construct more fine-grained and firmly dated culture-historical sequences than would otherwise be possible. Third, calcium carbonates from the shells cause shell middens to be depositional environments that preserve organic remains – for example, the bones of animals used as food, tools and artistic/ornamental objects made from bones, teeth, antlers and shells, and human skeletal remains – infrequently preserved in the generally acidic soils characteristic of much of Canada. These finds allow for more detailed understandings of past technologies, lifeways and symbolic/spiritual behaviours. Fourth, and closely related to the previous point, applications of quantitative zooarchaeological, growth increment and stable carbon and nitrogen isotopic analyses to organic remains from shell middens enable archaeologists to construct more complete understandings of the human ecology of past populations – palaeodiets, subsistence practices, seasonal rounds and settlement patterns. Finally, the bones of extinct species, and species whose geographical ranges have fluctuated through time, are frequently preserved in shell middens; these finds contribute to understandings of biogeographic change. In addition, techniques such as sclerochronology (the study of physical and chemical variations in accretionary hard tissues) and oxygen isotope analysis are being applied to shellfish remains from shell middens in studies of prehistoric human ecology and long-term climatic and environmental changes. For more information about the local First Nation history visit the K’ómoks First Nation website. We are often looking for extra hands to help with stewardship projects – from planting to invasive removal to education. To volunteer fill out our volunteer form we will contact you with dates and times our activities occur.